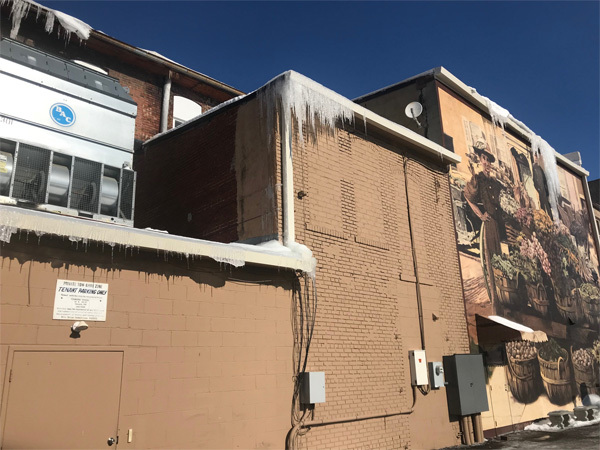 How can I tell if my businesses commercial roof has been damaged by hail or freezing temperatures in Columbus, Ohio? A commercial property’s roof serves numerous vital functions, such as enhancing energy efficiency and protecting the interior of the property from weather-related damages and pest infestations. While these and other benefits are enjoyed regularly, the reality is that a commercial roof is exposed to harsh elements that can potentially damage the roof at times. Some of the more damaging elements include hail and freezing temperatures. By walking through a few helpful tips, you can better determine if your commercial roof in Columbus has been damaged and requires repair work. A great first step to take when assessing roof damage is to walk around the perimeter of your building. This should be at a close distance as well as several feet away. Avoid venturing onto the roof for safety purposes. You may be able to spot some signs of potential damage by simply looking at the shingles, tiles or other roofing materials. Look for bows, divots, missing roofing materials and more from your low vantage point. If the roof is covered in ice and snow, look for potential ice dams. An ice dam occurs when some areas of the roof are warmer than others, and this can cause ice or snow to melt and for water to pool up. This can easily cause leaks inside the building. You can also look at the ground around your building to identify signs of roof damage, such as tiles, shingles or even granules from roofing materials laying on the ground. Another helpful step to take when you are concerned about the condition of your commercial roof is to venture into your attic. Look for current signs of moisture or signs of previous moisture that may have dried up. While some moisture may be caused by an HVAC system or a leaky pipe, other signs may be caused by a damaged roof. All types of damage should be repaired as soon as possible, but you may need to identify where the moisture is coming from before you can determine which type of skilled professional to call for assistance. You may or may not notice signs of potential damage to your commercial roof by taking these steps. Either way, a smart idea is to schedule a periodic roof inspection. This may be after a severe weather event or on an annual basis at a specific time each year. You may not be able to see the entire roof from the ground level, or you may not be certain if a potential problem area is actually a sign of damage. A roofing specialist can inspect every inch of the roof to tell you if any areas require repair work. Because of how important a commercial roof is to your property, you understandably want to keep it properly maintained at all times. By observing the roof regularly and by scheduling a periodic inspection from a roofing company, you can keep tabs on its condition and repair needs.